Attack of the Crab Monsters (1957) – People are trapped on a shrinking island by intelligent, brain-eating giant crabs. A small beach lies below below the Via Krupp, a switchback path that was paved into the hillside of the Italian island of Capri between 1900 and 1902 by German industrialist Friedrich Alfred Krupp. The path was officially designed so that Krupp could easily traverse between his marine biology research vessel in the marina and the hotel at which he stayed, but secretly it also guided Krupp to the Grotta di Fra Felice, where local youths were known to hold orgies. Krupp was asked to leave the island in 1902. Unfortunately, due to the hazard of falling rocks, the via has been more or less closed since 1976. Capri sits off the southern tip of the Gulf of Naples, and has functioned as a resort since the times of the Roman Republic. Following Claude Debussy and John Singer Sargent’s appearance, the island became a sort of open haven for artists, writers, bohemians, gays and lesbians in the 19th century. Grotta Azzurra, one of the symbols of Capri. What to do? Explore the coastline, caves and coves of turquoise water. Stroll through the piazzetta, or hike up Monte Solaro. There are several art and film festivals held on the island each year, and more hotels and b&b’s than you can even begin to consider, just don’t forget the moneybags. To get here, high speed ferries (hydrofoils) from Naples take under an hour, but surely the best way to approach the island is privately, under sail of course. 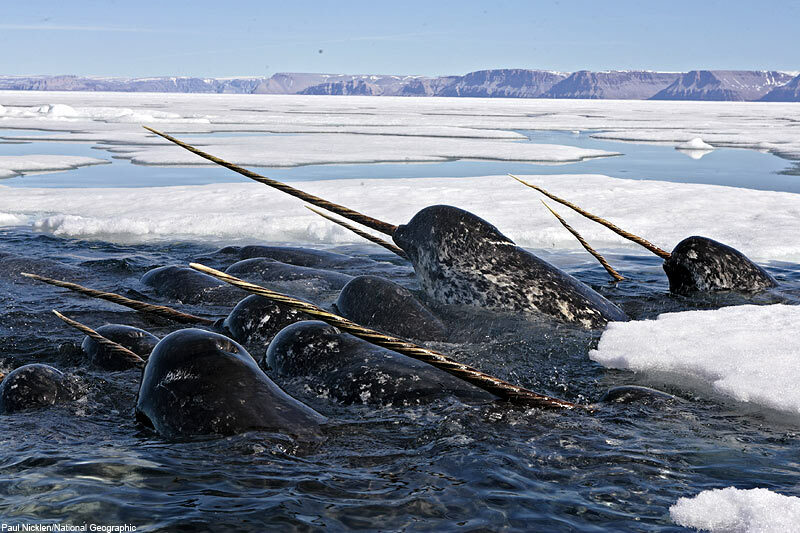 Greenlandic art researcher Svend Erik Hendriksen believes he’s solved a “1,000 year-old-mystery solved about Narwhals.” Their 3-meter-long tooth, oddly long and spiraled, has perplexed humans for quite some time. It would seem that the peculiar shape of the ivory would be more detrimental than anything else, but it does serve a purpose. A dental medicine student at Harvard University concluded in 2005 that the narwhal’s tooth has 10,000,000 nerve connections from the central nerve of the tusk to the outer surface. It was believed that the tusk is used to detect changes in water temperature and salinity, making it a good navigation instrument when the whale is in search of prey. 500 years ago, many Europeans believed that it had magical healing powers. ‘Look at architecture,’ says Hendriksen, of the Greenland Art Research Institute in Kangerlussuaq. Bridge cables and tall chimneys use the same pattern. Why? To cut through winds, preventing turbulence. For the narwhal then, we can only assume that the spiraled ivory that is the whale’s front tooth guides it through tough currents and helps it hunt with uninhibited precision. 1. In a small bowl, mix the tuna with the mayonnaise, celery, lemon juice, capers and oregano. Season to taste with salt and pepper. 2. Place a pepper on a small piece of plastic wrap and carefully make a vertical incision on one side; gently open the pepper to lay it flat. Spread a heaping tablespoon of the tuna filling in a thin line down the middle of the pepper, leaving enough space for the pepper to wrap completely around the filling. 3. Using the plastic wrap to guide the pepper, roll the pepper around the filling. Twist both ends of the plastic wrap to tighten the roll. Repeat with the remaining peppers. Place the peppers in the freezer for 15 minutes. 4. Remove the peppers from the freezer. Remove the plastic wrap and, using a serrated knife, slice the peppers into thin rolls. Arrange the rolls on a plate and return to room temperature. Drizzle with the olive oil, garnish with parsley and pepper and serve. A quick lesson to start things off: boats are made to be buoyant, but have had to deal with the problem of stability. The shape of seacrafts tends to a very dispersed center of gravity, which makes them susceptible to capsizing due to wind, waves, or even just people moving about. The solution that mankind has come up with is known as ballast. Ballast is basically very dense weight, centralized in the center of the hull of the boat, to provide a stable center of gravity. Ballast comes in many forms, and is most typically the ship’s cargo stashed in the bottom of the boat. In worst case scenarios, rocks or sand bags might be used. In 1942, the USS Trout, an American submarine, took on the strangest and most valuable ballast ever recorded in naval history: 20 tons worth of golden bars, valued at almost $10 million. The Louisiana Pancake Batfish, which at just two inches long appears more like a toad, was first discovered in the Gulf of Mexico just before the Deepwater Horizon spill. A bottom-dweller, it crawls around on the seafloor with arm-like fins while laying flat as a pancake with its bulging eyes ready to attack passing prey. A sort of angler fish, it has a beard of tassels, which are used to fool prey into coming within striking zone. Due to its odd looks and its habitat being covered by the oil spill, the Louisiana pancake batfish was just named one of the top ten new species of the year by the International Institute for Species Exploration out of Arizona State University and an international committee of taxonomists.